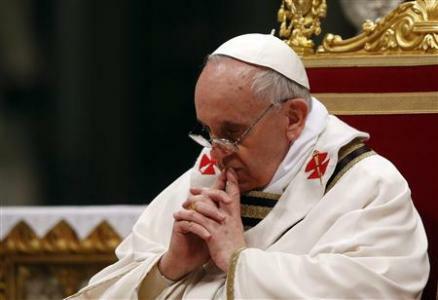 Just weeks after he made headlines for possibly making some controversial statements about the existence of hell, Pope Francis has issued a forceful warning about the devil. In an Apostolic Exhortation document called “Gaudete et Exsultate,” the Pope wrote that there is “a constant struggle against the devil, the prince of evil,” and made sure his followers didn’t think he was speaking figuratively. He wrote, “We should not think of the devil as a myth, a representation, a symbol, a figure of speech or an idea. This mistake would lead us to let down our guard, to grow careless and end up more vulnerable.” However, though the devil was mentioned several times in the document, he didn’t mention hell. The pope recently visited with his friend and newspaper publisher Eugenio Scalfari, and Scalfari said that the pope told him, “There is no hell, there is the disappearance of sinful souls.” However, the Vatican released a statement afterward, disputing the accuracy of the quotes—though they didn’t say Pope Francis denied that hell exists. Scalfari does not record his interviews, but reconstructs them from memory afterward. Though it’s still somewhat unclear about what the pope thinks about hell, one thing is for certain: he believes that the devil is very real, and thinks other Christians would be wise to remember that as well.